The year is 1306 – Robert Bruce is finally crowned King of Scotland, his rivals to the throne murdered or in retreat. But the triumph is shortlived, the prophecy as fragile as ever, as Sir Aymer de Valence, earl of Pembroke and cousin to Edward I of England, heads northwards, taking advantage of all those with an axe to grind against Robert, forcing the rebel king to the north-western edges of this unhappy kingdom. So begins eight long years of tug of war between Robert and the English for control of Scotland, culminating in Bruce’s great victory at the Battle of Bannockburn in 1314. Nothing about this is straightforward, though. Bruce has to fight tooth and nail to hold his men together, to inspire them to keep on fighting, to bargain ruthlessly with the mercenaries and disinherited, to brave the greatest hardships and personal dangers and, most horrible of all, to endure the loss of his wife, daughter and sisters, captured by Edward and treated with great cruelty – his daughter and sister caged like animals. 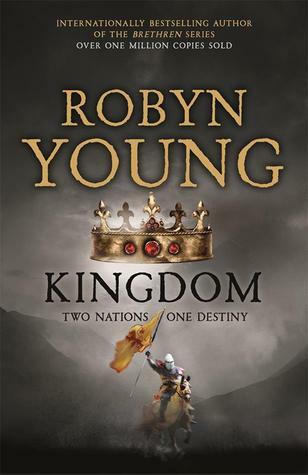 Kingdom completes Robyn Young’s Insurrection trilogy – three meticulously researched, passionately intense novels that bring to life the figure of Robert Bruce with all his strengths, weaknesses and drive. There is no doubt that Robert had his flaws, his repeated switching of sides in the previous novel Renegade made him a difficult character to like. He is also not easy to love, just look at his wife, brothers and father. But Robert Bruce is a man with a destiny and in this world in which legend and prophecy are vital, if only as inspiration to others, he cannot turn back. In Renegade I had a real problem with Robert. I thought him a dishonourable man. I liked him no more than I did Edward I. By contrast, there were an awful lot of women I felt sorry for as well as the men hurt by Robert’s betrayal. In Kingdom, though, Robert atones. In this novel, everything comes to a head, literally at Bannockburn, but also in every other way. He is now set on his destiny and he becomes the hero we want him to be. He is king and there’s no turning back. Sir Aymer is now the unsympathetic figure, chasing Robert and his men over hill and dale, through forests and across rivers and seas. Edward I is a dry husk of a man, dying piece by piece, drained of blood, but unable to let go of life, still able to fly into violent fury at the behaviour of his son and heir, intoxicated by his lover Gaveston. The men that Robert betrayed, notably Humphrey de Bohun, the Constable of England, fight for Edward and his son but loyalties are severely tested, particularly when Humphrey suspects that King Edward’s reimagining of an Arthurian circle of knights was based on lies. Humphrey never loses our sympathies even though he fights on the ‘wrong’ side. As with Renegade, the female characters are especially powerful in Kingdom and complement the male dominated military action perfectly. Robert’s queen, Elizabeth, is an intriguing figure, tragic, I think, and I liked the pages spent with her very much. Another character that stands out is Alexander Seton, a nobleman who discovers he no longer knows what he’s fighting for. The muddle he gets himself into is hugely involving and it’s hard not to like him. There is no fear of liking either Edward the father or Edward the son, although both are highly entertaining on the page. But Robert now comes into his own, filling the pages of Kingdom with his personality, working on the reader’s affections, winning us over bit by bit, revealing a little of his personal struggles and motivations, making him seem more human than kinglike, earning our approval and support until the book becomes an exercise in tension, drama and suspense. Robyn Young writes so beautifully. Her medieval knowledge is clearly vast but it is coated in the most stunning prose that moves the story forward while injecting it with a world of historical colour and flavour. The battle sequences, which feature throughout the novel, are brilliantly done, but so too are the moments of reflection. At the heart of Kingdom, though, lies the complicated and often painful relationships between these remarkable people. This is so well done and shows what a miracle it was that Robert was able to tie it all together to bring about such a great victory. I loved this book. I read the final two thirds in just one day, despite the far less pleasant claims of work on my time. I would argue that each of the novels in this trilogy stands very well alone but as a collection they provide an extraordinary portrait of one of the great duels of medieval history as well as one of its most difficult to know figures. I can only look forward to discovering where Robyn Young will take us next. Kingdom has set the bar very high indeed. This entry was posted in Historical Fiction, Medieval, Review and tagged Historical fiction, Medieval on July 17, 2014 by Kate (For Winter Nights). Kingdom ten out of ten ,superb.